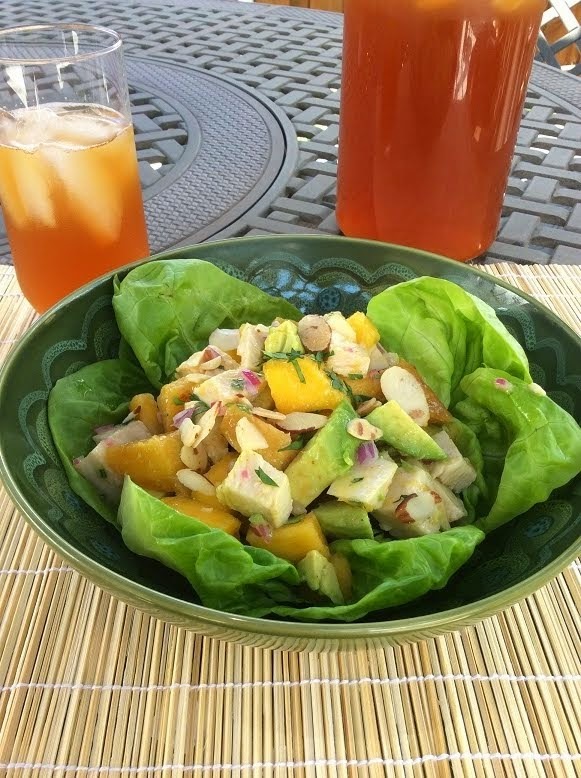 A Foodie Gets Fit: My First Mystery Quilt! So, in addition to being a food-type person and a sometimes-Ihavebeenatotalslothlately-fitness-type person, I am also a crafty-type person. Since I had a few days off for Thanksgiving, last week I decided to undertake my very first Mystery Quilt. 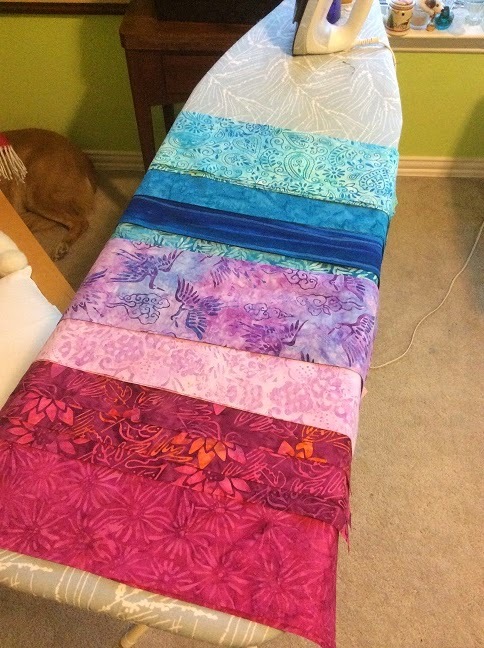 A mystery quilt is where you are told how much fabric you will need, and in what colors. Then you get the instructions each week of what blocks to cut and piece, and how many you need. You do this not knowing what you will have when you are done. Hence, it's a mystery. That reminds me of the movie Shakespeare In Love. What happens next? I don't know, it's a mystery. Speaking of movies, this mystery quilt is called the Grand Illusion Mystery Quilt because the designer, Bonnie Hunter of Quiltville.com, was inspired by the colors she saw at the Grand Hotel in Michigan, when she stayed there last spring. That's the hotel featured in the movie Somewhere In Time. Great movie. 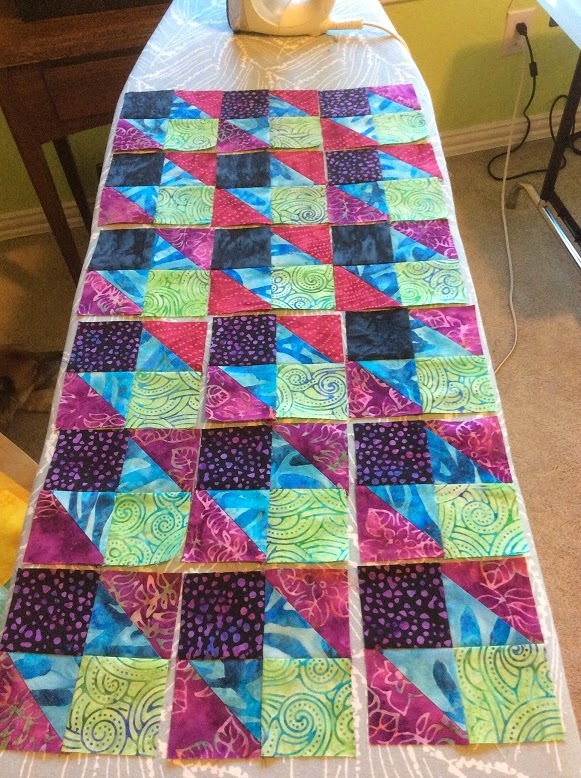 The colors of the quilt are yellow, green, pink, aqua, and black. As there are no quilt police, you don't absolutely have to use those exact colors. I am using similar, but not exact, and almost all of what I'm using is from my stash of fabric. Last week, when I was working on my Crystal Santa wall hanging quilt, I griped about how much I dislike half square triangles. Guess what??? First clue instructions were to take the pink fabric and the aqua fabric and make 280 half square triangles. Yay. Here are some of my pink and aqua strips. 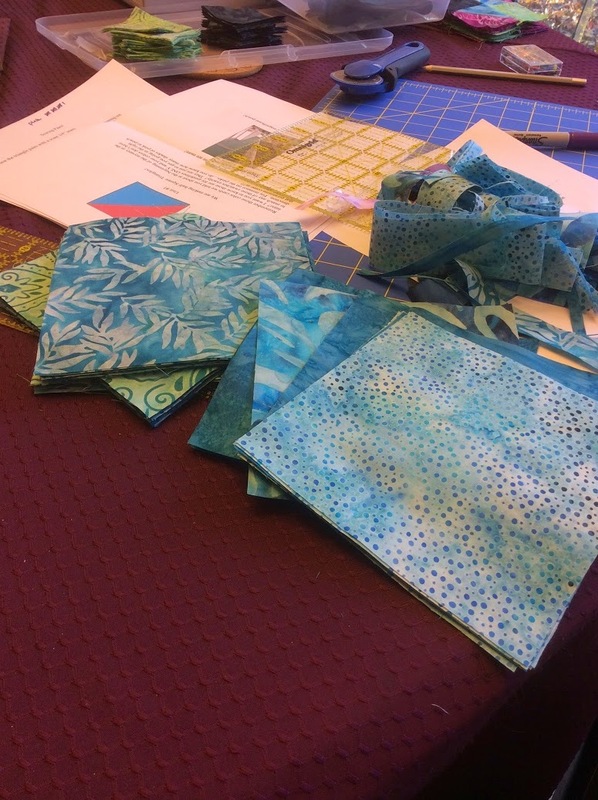 I read about the Magic 8 method of making 8 half square triangles at a time by using larger squares that you mark, sew, then cut. Seeing as I am not the most accurate cutter of fabric, I figured that would be a good way to go. I went a bit overboard cutting my aqua squares. Hopefully they can be used in later clues. I got a bit distracted. Here are my first batch of blocks done. We need 100 of these, so I will be back at my sewing machine during lunch and after work. thanks for that lighthearted approach to accepting the burnt side of your hst's. Great colour choices too btw. 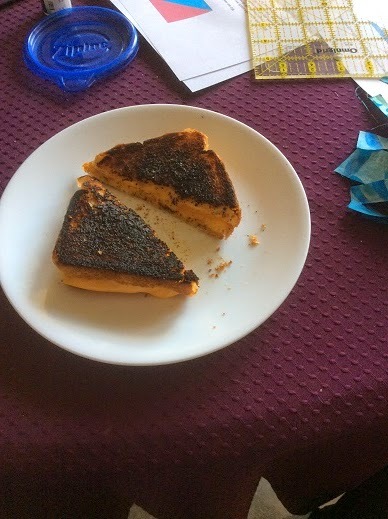 wonderful colors and as i said on fb, i love burnt grilled cheese. Oh what fun! I miss quilting.I think the last thing I did was a simple baby quilt for John's crib before he was born. You know, my 8 1/2 year old? Hi there, I'm Lindsey! I have a question regarding your blog. Could you please email me when you have a moment? Thank you so much, looking forward to hearing from you!